The number of children under the age of 15 who end up in hospital every single year as a result of toys accidents is around a staggering 35,000. 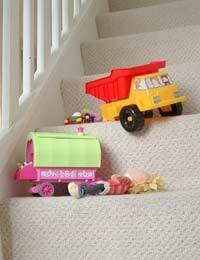 Most of these toys accidents seem to happen to toddlers – children aged between one and three years old. So when it comes to toys safety, what are the key things you need to know? Which Toys Can Be Harmful Toys? Model cars, trains and aeroplanes are the causes of around 4,000 visits to accident and emergency departments every year. Most of these accidents happen to children under three who have been injured by small parts in toys that they were too young to really be playing with. Soft toys like teddies and dolls are responsible for more than 1,500 toys accidents a year. Just like with most toys, the under threes are most likely to be injured through playing with soft toys, as it’s the small parts such as eyes, buttons and pieces of stuffing which cause problems. A good method of accident prevention when you have very small children is to not let them play with harmful toys which have child safety labels warning you that they aren’t suitable! Ride on toys such as cars or rocking horses can cause toys accidents such as cuts, bruises and fractures if children fall off of their favourite toy. Toys that fire objects, like bows and arrows and water pistols cause over 1,000 accidents each year. The reasons for this are obvious! It’s essential that you always take into account the toys safety labels on anything you give your child to play with. Many toys accidents are caused by small children getting hold of toys intended for older kids, so make sure that older siblings know why it’s so important that they tidy up after themselves. Most toys have a suggested age range on the packaging, but a toy safety warning symbol which tells you that a toy is not suitable for children under 36 months should not be ignored, because it means that the toy may contain small parts that could choke a very young child. Child Safety - Accidents Caused By Untidy Children! Of course, it’s not just the toys themselves that can cause injury if you’re not careful – it’s what your children do with the toys when they have finished playing with them! Accidents tend to happen when children – and adults – trip on toys left lying in unexpected places, so if your child has a habit of leaving things lying around, nip it in the bud. Accident prevention starts before your child even picks up a toy, so to avoid toys accidents and injuries, follow this checklist when you’re looking at a toy. Does the toy you’re thinking of buying have any moving parts? If so, check it to make sure that their little fingers won’t get trapped in the mechanism. Is the toy made of wood? Make sure it is smooth and splinter free. Will the toy have to bear the child’s weight? Does it look sturdy enough to carry your child? Does the toy have any attached strings or straps? Think about whether the toy could turn into a strangulation hazard for a young child. A little forethought and attention to detail - plus insistence on tidying up toys - can go a long way to improving toys safety, and preventing toys accidents.